The mornings are cooler; the leaves are starting to turn and fall is in the air in North Florida. What better way to celebrate this glorious season than with a steaming bowl of smooth, velvety Fall Feast Roasted Pumpkin Soup! 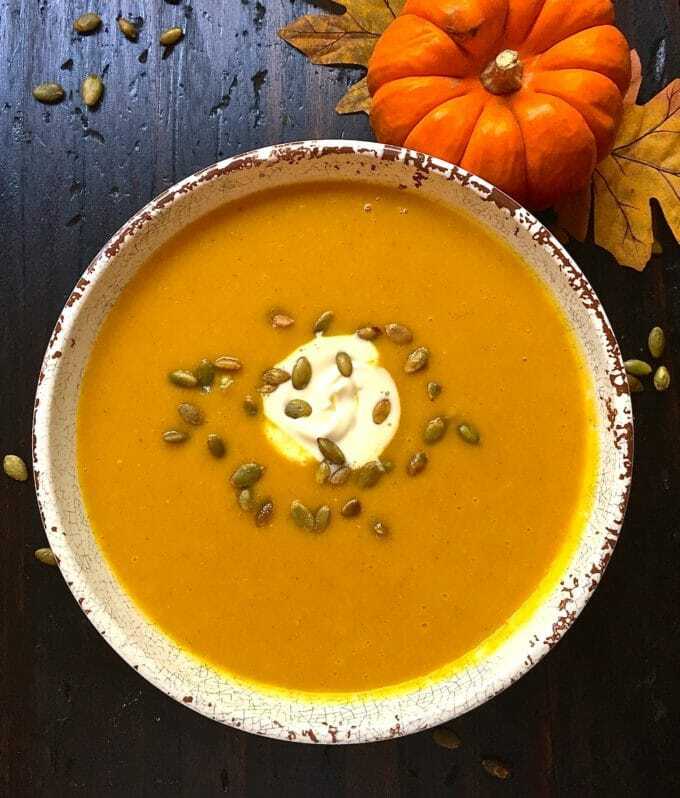 This delicious, savory and flavorful Fall Feast Roasted Pumpkin Soup would be a great first course for Thanksgiving or as an easy, healthy, light meal all by itself. Pumpkins are fall’s super-food! They are packed with fiber and rich in beta-carotene and tryptophan, which helps you sleep better. They have two times the recommended daily amount of Vitamin A and are full of phytoestrogens, which help to lower blood pressure. Did you know there is a difference in the pumpkins you see in grocery stores and pumpkin patches? There are over 40 varieties of pumpkins, which are a type of winter squash. All pumpkins are edible but for cooking and baking pie pumpkins are best. They are usually smaller and denser, and the best part is they are also generally on sale this time of year! My friend Harriet invited me to attend a cooking class with her at Browns Kitchen Store in Tallahassee last weekend and what a treat it was. Chef Benny Beutjer prepared a fabulous Southern Fall Feast lunch for us, and it was spectacular! His menu included Fall Feast Roasted Pumpkin Soup, Herb-Dijon Crusted Pork Tenderloin, Wild Rice Pilaf, Sweet Potato Puree, and a decadent Chocolate Bread Pudding with Bourbon Caramel Sauce. 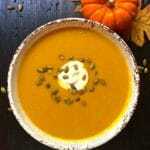 Chef Benny gave me permission to share his recipes with you, and I couldn’t wait to share his recipe for Fall Feast Roasted Pumpkin Soup. If you are in Tallahassee and would like to find out more about Browns or Chef Benny’s classes, visit www.brownskitchen.com. If you like this soup recipe, you might also like these other quick, easy and healthy soup recipes: Traditional Irish Potato Soup, Roasted Chicken Noodle Soup, Easy Crockpot Chicken Tortilla Soup. Want more delicious recipes? Click here for links to all of my soup recipes. 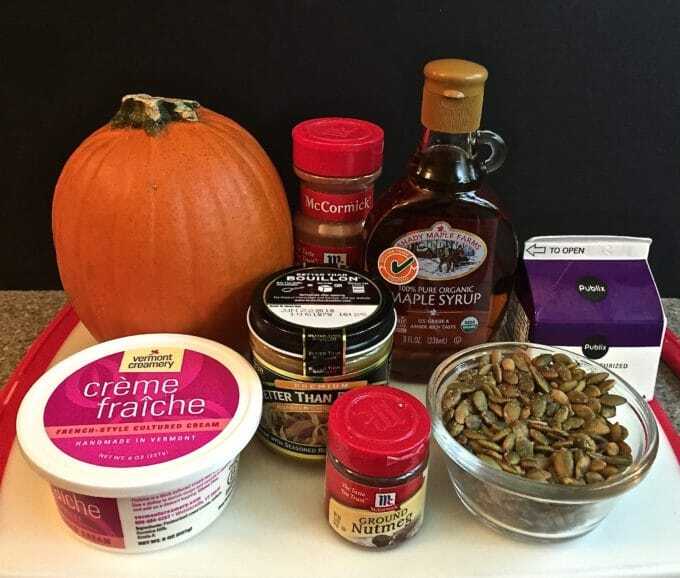 The ingredients for Fall Feast Roasted Pumpkin Soup are pie pumpkins (you could substitute butternut squash), olive oil, chicken stock, heavy cream, maple syrup, nutmeg, cinnamon, and salt. Also, you will need creme fraiche (you can substitute sour cream if you can’t find creme fraiche) and roasted pepitas, which are roasted green pumpkin seeds. Chef Benny also recommends using Better than Bouillon chicken base which comes in a small jar and making homemade chicken stock instead of purchasing pre-made chicken stock. To get started making this delicious soup, gather your ingredients and preheat the oven to 350 degrees. 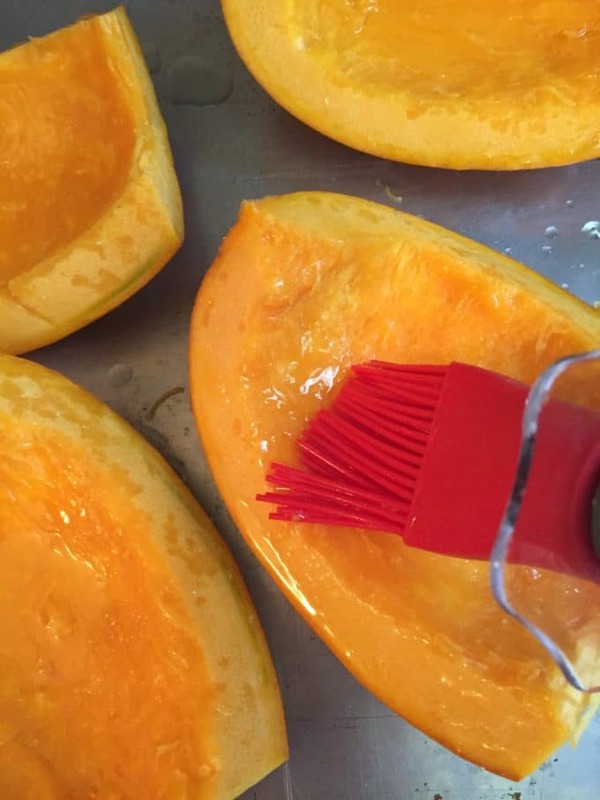 Cut the pumpkins in half and use a spoon to scrape out the fibers and the seeds. A serrated grapefruit spoon works great for this. Cut the halves into quarters and place them on a baking sheet. 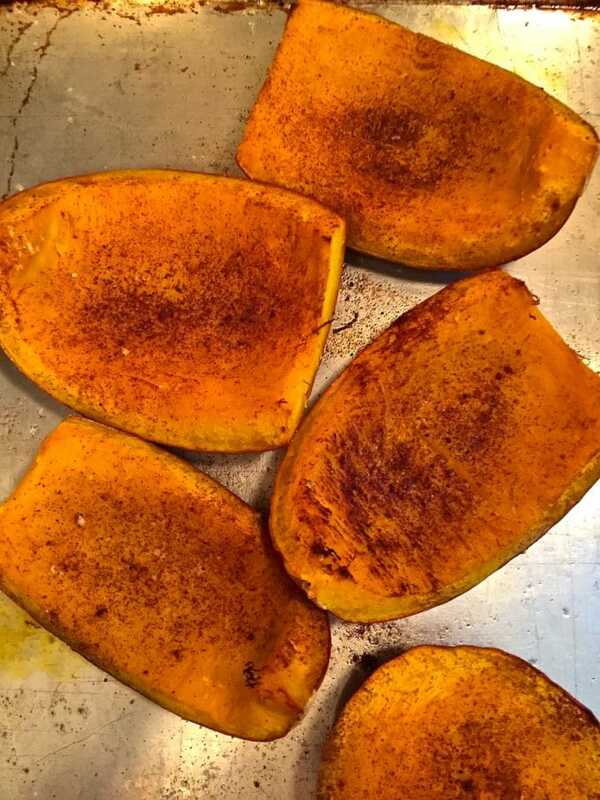 Brush the inside of the pumpkins with olive oil and season with a little salt, cinnamon, and nutmeg. Roast until the pumpkin is soft, about 30-45 minutes depending on the size of the pumpkin pieces. Allow the pumpkins to cool slightly and then pull off the peel and put the flesh of the pumpkins into a medium-size saucepan. Use a potato masher and mash the large chunks. Add the chicken stock and maple syrup and cook on medium until the mixture starts to simmer. Turn down the heat and use an immersion blender to puree the mixture until it is smooth and velvety. You can use a regular blender if you don’t have an immersion blender, but you may have to process it in batches. Add the cream and a little more nutmeg and cinnamon and blend again to help the flavors come together. Taste and add additional salt, cinnamon or maple syrup if needed. To serve the soup, ladle into a bowl and top with a small spoonful of creme fraiche and toasted pumpkin seeds. 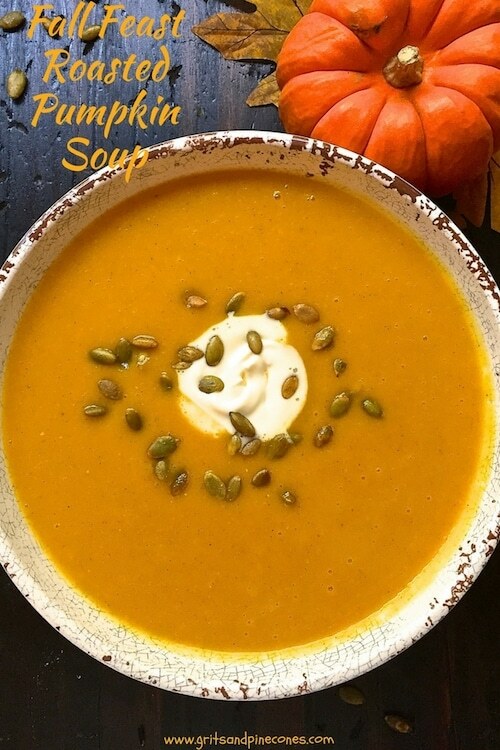 This delicious, savory and flavorful Roasted Pumpkin Soup would be a great first course for Thanksgiving or as an easy, healthy, light meal all by itself. 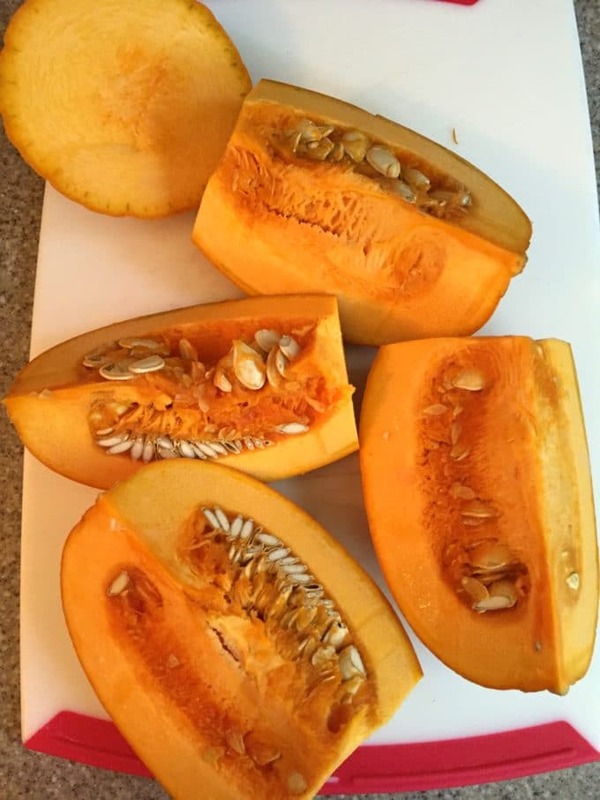 Cut the pumpkins in half and use a spoon to scrape out the fibers and the seeds. A serrated grapefruit spoon works great for this. Cut the halves into quarters and place them on a baking sheet. Allow the pumpkins to cool slightly and then pull off the peel and put the flesh of the pumpkins into a medium size saucepan. Use a potato masher and mash the large chunks. Add the chicken stock and maple syrup and cook on medium until the mixture starts to simmer. Turn down the heat and use an immersion blender to puree the mixture until it is smooth and velvety. You can use a regular blender if you don't have an immersion blender, but you may have to process it in batches. To serve the soup, ladle into a bowl and top with a small spoonful of creme fraiche and pumpkin seeds. Thanks for sharing, can’t wait to try it, now about those cooler temps? I heard they are headed this way next week.? Cooler is always good! It really is delicious and easy to make! I enjoyed the recipe and commentary about Southern Peas, and Tomato Land. Thank you! Tomato Land was an institution around here!